Here's some thoughts and suggestions on ways to improve your prints by designing them in a way that makes them easier to print. Since the printer nozzle is round it is impossible to create a perfectly sharp outer corner on your parts. Depending on your print speed there's also a very good chance that you'll get some additional oozing at the corners since the print head needs to slow down in the curve. During the slow down the builtup pressure in the nozzle causes some excess plastic to sneak out creating a slightly thicker extrusion. This picture shows the effect. 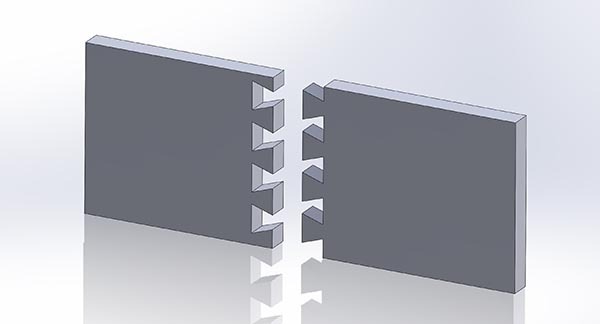 This corner was designed to be perfectly square in CAD but as you can see the machine is not capable of creating this edge. What's worse is that there is some slight material build up. Now, the corner become slightly rounded is probably not a problem in most cases. But what if you were trying to make a square part fit into a square hole, such as a lid? This extra build up could prevent that from being possible without adding additional clearances all around the part. Because of this it can be a good idea to make the corners or your parts slightly rounded at the design stage. This way you'll have better control over it. Given that objects in a 3d printer are built layer by layer there are some interesting things you can do by taking advantage of this fact. One such thing is to print assemblies in place. That is, instead of creating multiple separate pieces that you then mount together, you can (in some cases) print the pieces already assembled. The biggest challenge when creating designs for this purpose is to make sure that the different parts do not stick together and are unable to move relative to each other. This is mostly a problem on the areas of the print where one part is lying on top of another. It is much harder to control a strand of plastic that is extruded into mid air as it will sag unpredictably. Because of this it is important that you leave enough clearance between the two parts to allow of this sagging. How big that clearance needs to be is difficult to give a straight forward answer to. If the overhanging part is very small, say 10mm across, you may get away with a clearance as small as 0.5mm. If it's longer or if it has an intricate shape you may find that it sags down considerably more and you'll have to compensate for this accordingly. By far the easiest way to figure out how much you need is to simply print out a test piece and see what happens. Create a small test part so that you don't have to waste more time and plastic than you need. In the example below is a hinged dust filter that is printed as a single piece. The top part of the image shows the entire part while the lower image shows a section cut of the hinge. As you can see we've respected the 45degree rule by making the overhangs of the hinge stay at 45 degrees. This makes it easy for the printer to handle but we also completely avoid the problem of sagging that could cause the two parts to fuse. In the X-Y direction this isn't nearly as big a problem and you can design parts with quite tight tolerances. 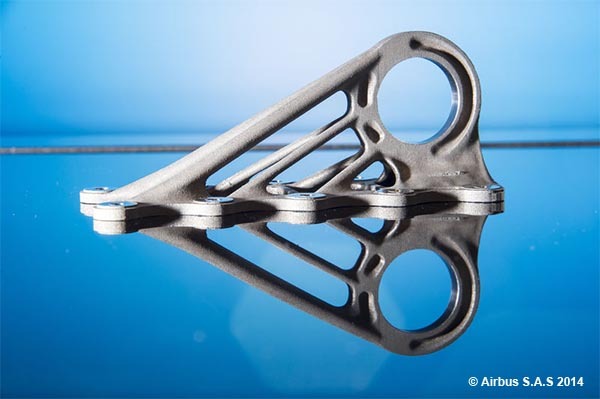 We've created parts with as little as 0.2mm of clearance. The one problem that you may run into is with stringing which can cause the parts to fuse together. You can read more about stringing and what you can do to lessen its impact here. Of course you're not limited to creating parts that interlock or interact directly. One very common example is the whistle where the little ball is printed inside of the whistle from the start. After the print is done the ball is simply broken free from the rest of the print and is free to rattle around inside of it. What we mean by this is that the printer doesn't care if it creates a cube or an intricate set of shapes. Granted, a simple cube doesn't use any retraction or many travel moves to speak of, so print time will be slightly lower. But if we simplify things a bit, complexity is "free". The classic example used for this is parts designed for commercial airplanes such as the bracket below. Since we are not limited by what shapes we can cut out of a solid chunk of metal we can optimize the shape and get rid of material. Something else that you are not able to do with traditional manufacturing is designing voids into your model. 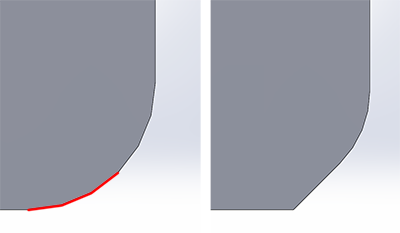 To save weight you can create completely hollow parts, or hollow out areas of a part. By placing these voids in strategic places you will reduce material usage, reduce the weight of the part and still retain strength. In traditional manufacturing you can do something similar by drilling/milling away areas of the part, but with 3d printing you can hide them from view. And since you have a thin "skin" over the holes it will also aid in strength. Even though the print area of an Ultimaker and Ultimaker2 is quite spacious there is of course a limit and to go bigger you'll have to break your print up into several pieces and join them together. There are a multitude of ways to accomplish this. The most straight forward is of course to just simply glue the parts together. This works well but you're using a 3d printer, complexity comes more or less free as far as the printing goes. So, why not get creative with it? But to go back to glueing for a second. To aid with this it's a good idea to add alignment holes and pegs to your parts. A simple round hole and a round peg is usually enough to make sure your parts align correctly and stay in place while the glue hardens. It also aids a bit with structural integrity as it will help prevent the parts from shearing apart. If you are joining a thin standing piece to a larger piece, say a wall, you can also print guides to aid in keeping the part square with the other print. 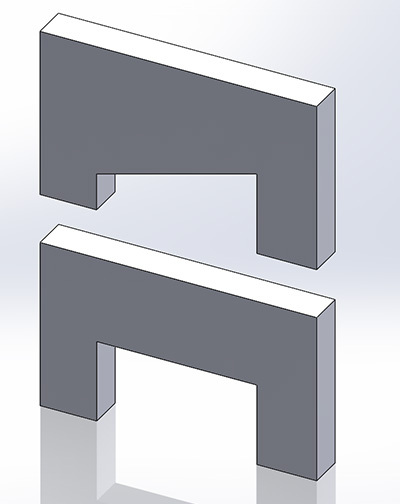 Create a couple of locating holes to keep the part at the correct location and then create a thin, breakaway, guide in the correct location to keep the part square. If glue isn't your thing you could consider taking a few hints from the wood working world. Dove tail joints are widely used in wood working and there's no reason you can't use it for your 3d prints as well. Since complexity is essentially free you could even design threads to join the parts together, permanently (by adding some glue) or temporarily. Don't be afraid of printing in more than one part. While it's attractive to print a large piece, snap it off the platform and be done, sometimes it's not the best way to go. There's a couple of good reasons to print something in several parts. For one, you might be able to get rid of support which, let's face it, is a pain to remove a lot of the time. Another reason which might be more important to you depending on what you're making, is strength. Let's start with the first one. As you probably know already, overhangs are difficult to print. Of course your best bet is to try and design your model in such a way that overhangs are eliminated. But if that's not possible you can break up your model into several sections and orient them in such a way that the overhangs are no longer a problem. Here's an example of a shape that will be difficult to print in one part no matter what orientation you choose. You'd have to add and remove a lot of support material to be able to finish that print. However, if you simply break it into two parts it suddenly becomes very easy to print and all you have to do is put it together with some glue. Also note the locating hole and peg. I've also added some fillets and chamfers to make it easier to insert. Strength is another good reason to maybe break things up. If you print thin column standing up on the bed you'll be able to very easily snap it, print it lying down and it will be much stronger. So what you want to do then is of course to orient the parts to take advantage of this. Say you're creating an object that is a cylinder on top of a box. Where the cylinder joins to the box there's a sharp transition and this is where the part will break when it is subjected to loads tangent to the cylinder. By putting a radius at this point you will make the part stronger. It will still break at the same point but it will be made stronger. By putting a radius here you will also create a bigger base of solid infill for the cylinder. cura will only put solid infill on an area slightly larger than the cylinder underneath it. With the radius you increase this area ever so slightly aiding in strength further. At the end of the day these printers are making parts out of plastic and no matter how fancy the plastic, metal will likely be stronger. Why not mix the best of both worlds? With the built in plugin "Pause at Z" it is easy to automatically stop mid print, add hardware and then resume the print. A great use for this is to drop in nuts to give screws a real metal thread to screw into. While you could tap a hole in the plastic using either a proper tap or by using the screw and friction to form a thread, you can't beat metal to metal. Remember that a screw can create some serious torque so make sure you have enough material holding the nut in place to be able to resist the amount of torque you're planning to put on it. You could also consider strengthening the area around the nut by either printing more perimeter lines or by tricking the slicer into creating solid infill where needed. Horizontal holes through a model will cause a severe overhang to form at the top of the arch. This means that, generally, a horizontal hole will be a bit squished at the top and therefore smaller than intended. There's a couple of things you can do to combat this. The first approach is to change the shape of the hole by making the hole look more like a cartoon waterdrop. This makes it easier for the printer to handle and you get a bit of a margin for error so to speak for any droopage. You might not like the aesthetics of that approach, so another thing you can try is to create a thin support membrane to help hold up the top of the hole. Rather than covering the entire hole it's a good idea to make the support narrow at the bottom and let it grow towards the top of the arch. This makes it very easy to snap off. If the hole isn't so much for the looks but more for practical uses you may also consider experimenting with different hole shapes alltogether. How about a triangle or a square with one of the corners pointing up? 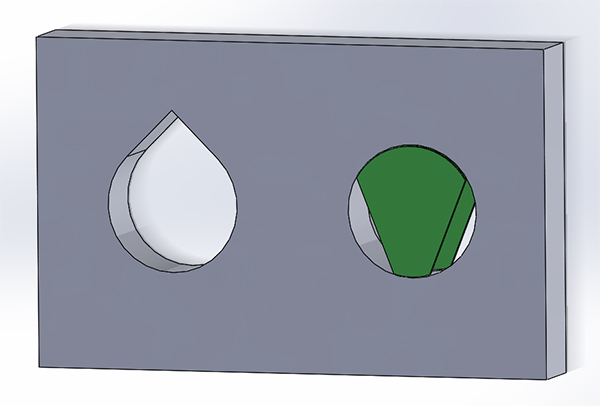 These would probably mostly be useful for smaller holes though as it would leave quite a gap on the sides of the screw. Most of you reading this guide will be using cura to prepare your parts for printing. 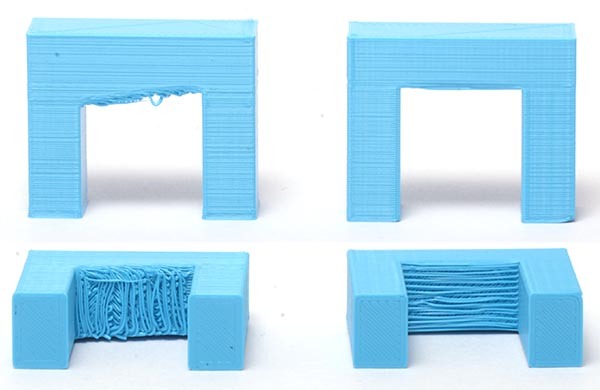 At this time cura does not allow you to use multiple settings for infill in a single print. 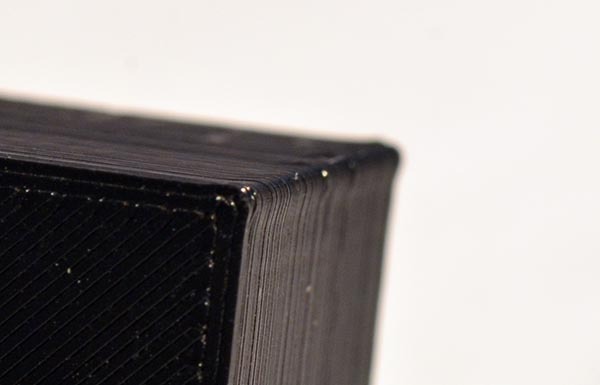 If you have a part where you need extra strength in just a small area of the print, such as around a fastener, you will have to increase the amount of infill or perimeters for the entire print. 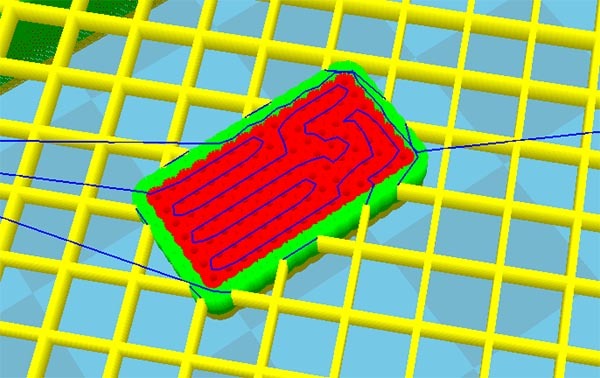 A trick you can use to get around this is to create geometries that forces cura to put down more plastic in the areas you need. The way to do this is to simply pierce the area with a group of cylinders. 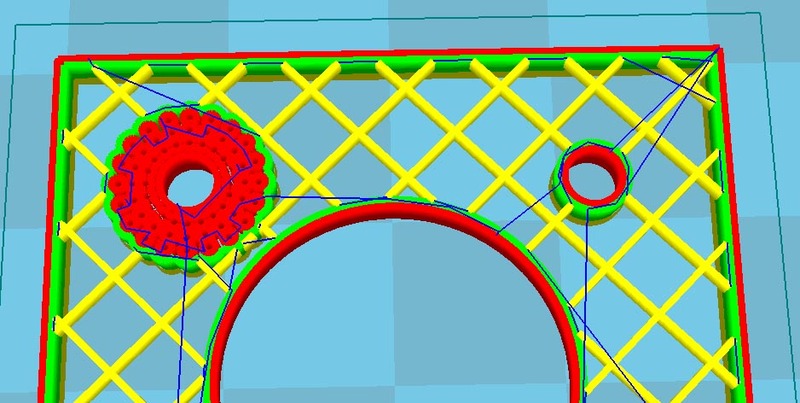 This will cause cura to print a bunch of perimeter lines around the cylinders which in effect will fill in the area more densely. Here's an example of what will happen. 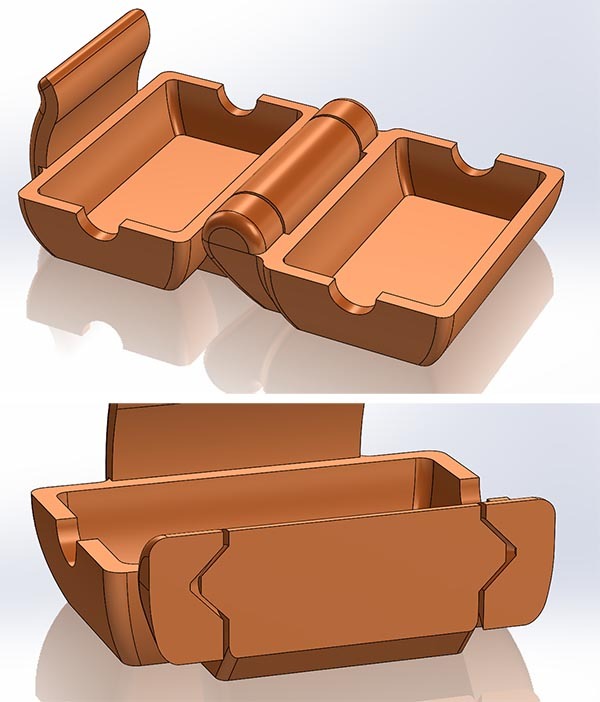 This is of course a silly example, just a box with some random extra infill, but it shows the principle. In this case we used 0.5mm diameter cylinders spaced 1mm apart but you should experiment with spacing and size to fit your specific needs. If the cylinders do not pierce the outer surface it could happen that weird things happen. You might have to play around with the "Fix horrible" settings in cura if the cylinders disappear on you during the slice. Always check layer view before printing to make sure you're getting what you're expecting. Here is another example where we've added a bunch of holes in a circular pattern around the mounting hole in the model. As you can see the infill isn't completely solid but it's a lot more solid than the hole on the right that is "untreated". Again, you could of course simply increase the wall thickness in cura to achieve a similar result but there might be times where this is a better approach. If you have a very large model for example where only a very small section needs the additional strength this method could save a lot of print time. Warping happens more at sharp corners which is where the stresses in the part will be the greatest. By rounding off corners you will reduce this effect slightly. To make it easier to understand the strength of your printed parts it helps to think of them as if they were made of wood. If you've ever chopped wood you know that it is very easy to split a log along it's length but if you try it the other way you'll be hacking away for ages. Similarly if you have a thin sheet of wood it can bend and flex on one direction but if you bend it in the other it will split along the grain of the wood. Apply the same kind of thinking to your prints. Orient and design them in such a way that they are always as strong as possible. If you have a complex part with several pieces jutting out it might be a good idea to actually break your part up into several pieces that you assemble after printing. You might even save time doing this as you may be able to avoid printing any support at all. Now this isn't so much a specific modelling tip, more of a good thing to think about tip. As mentioned elsewhere things that are printed tend to shrink as they cool down. This is especially problematic for small holes. To help with this you need to scale your holes/geometries to compensate. With time you'll start to get a feel for this and know instinctively about how much you need to compensate. Also worth mentioning is that if your model has a very low poly count this will also make a hole smaller. Since a hole is represented by a series of straight lines a low poly count means that the lines will encroach on the diameter of the hole. This usually doesn't amount to much, but it's something to keep in mind. But to make it easier on yourself you can model and print a reference for yourself. Create a model that has a series of holes, each slightly larger than the last, both horizontal and vertical. This way you can easily try to insert whatever you're modelling the hole for in the reference and know what size to use. Manifold, what's that and why is it important? A model that is not "manifold" is a model that can't exist in the real world. It could be that there are edges or vertices in the model are disconnected and floating in space, you could have an internal face or you could have areas with zero thickness. It is also common to refer to it as models that are not "water tight" which could be caused by holes in meshes for example. It is important to fix these issues as they will confuse your slicer and could make it produce very unpredictable results. cura has a number of "Fix horrible" settings in the expert settings dialog that can work around these issues. 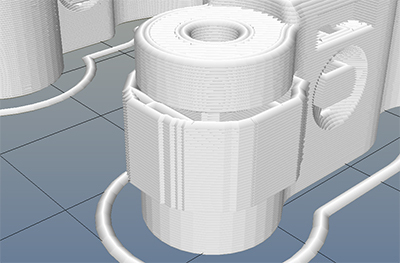 There's also a free tool from Netfabb that can repair models, you can find it here. It may also be possible to change the export settings in your CAD program to help guard against this. Things like the resolution of the exported model can be a factor. Design custom supports instead of relying on auto generated to lessen surface scarring. Here's what a model like the one pictured above will look like printed.